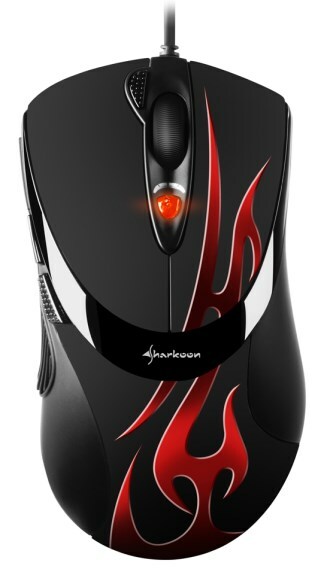 Sharkoon presents the FireGlider Optical, a low-budget gaming mouse with a MSRP of only 17.99EUR. Sharkoon has expanded their range of gaming peripherals and presents a revised version of the popular FireGlider gaming mouse for lovers of optical mice. The new "FireGlider Optical" is now equipped with an optical sensor, which offers up to 3,000 DPI and 3,600 FPS. Through the DPI selector, the sampling rate of the sensors can be adjusted up to five levels from 400 to a maximum 3,000 DPI. The DPI levels are represented with different colors or color combinations. The proven layout of the FireGlider was maintained and provides a matte finish with flame design. As before, the thumb rest ensures a secure hold. In the bottom of the FireGlider Optical is the famous Weight Tuning System, which consists of seven interchangeable metal weights. Thus, the weight of the mouse can be adjusted from 118 grams up to a maximum of 135 grams. Players can adjust the weight to suit personal preferences. Five of the seven buttons are freely programmable with functions being assigned through the included software. In addition, individual macros can be created and transferred to the onboard memory of the mouse. The FireGlider Optical connects through its 180 cm long textile coated cable with gold-plated USB plug. Included within the packaging is a CD containing the configurations software and manual, an additional set of synthetic mouse feet as well as a transport pouch.